Note: VFC and VFJ files saved in FontLab 6.1.3 cannot be opened in FontLab VI 6.1.2 or in earlier versions. Drawing and editing glyphs: move nodes or handles with cursor keys after dragging; add nodes, remove nodes, guides, components or kerning pairs using two mouse buttons; perform direct non-node segment editing with more precision; instantly scale and flip selections with Selection frame; easily make slanted glyph guides; automatically relocate the first node with Set Start Point; use the new Add Nodes action. Elements: filter and remove elements in the Gallery panel; easily add new elements/components to a group; remove or reorder elements/components while in Font window; view Scoreboard coordinates when moving elements/components; copy appearance or element structure when filling a new layer with the content of another another font or master. Metrics, auto layers and expressions: update linked metrics and auto layers live or on demand; turn auto layers on/off in all masters; enjoy more consistent anchors decomposition; easily edit glyphs from the Metrics window. Classes and tags: import and export classes; control what happens when you add glyphs into a Kerning Class; use additional virtual tags. Features and hinting: import features from multiple font formats; use tags and virtual tags in feature definitions; manually add horizontal ghost hints. Sketchboard: save and restore text boxes. Font formats: save backups in a subfolder; easily customize font export settings; use hyphens in glyph names; export single-stroke fonts for engraving; enjoy countless improvements in exporting instances, handling OpenType color fonts and UFO packages. App updates: decide if you prefer to get stable or beta versions of FontLab VI. Bug fixes: glyph drawing and editing, Tunni lines, Smart Corners, flattening of compound glyphs, Paste Special, the Mask layer, Element Guides, the Gallery panel, the Font Window, OpenType features, TrueType hinting, Undo, Python and font format support. RightFont 3.1.3 – Manage and find fonts quickly; integrates with Photoshop and Sketch. 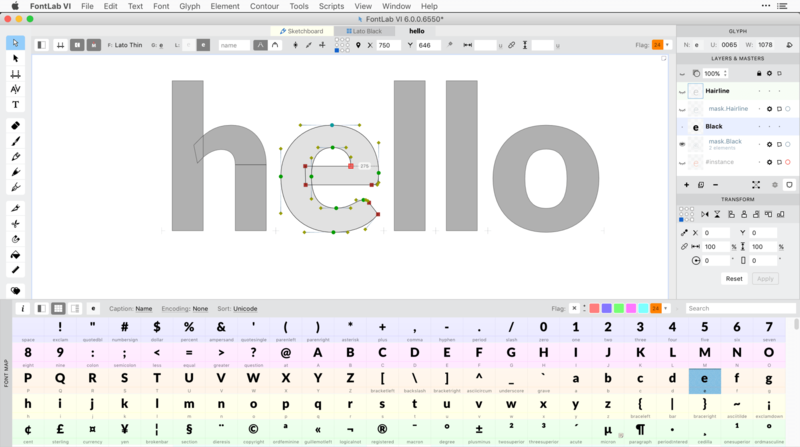 RightFont 3.0.0 – Manage and find fonts quickly; integrates with Photoshop and Sketch.